Grains of sand, often technology shaped. Tablet market playing by netbook rules or by mobile phone rules? In terms of manufacturing, the age of tablets is different from the age of netbooks mostly because there is no way to make a cheap tablet. You only have a certain, finite amount of space inside a small tablet case and, more important, tablet PC parts are expensive and often custom-built. Touchscreens are expensive because mother-glass manufacturers see Apple buying up their stock and they hope to make a killing. Flash memory is expensive because, well, Apple bought it all. And the tablets themselves are expensive because Apple set the prices. If Motorola could have gotten the Xoom below $250 I?? ?m sure they would have but, given that there is a more popular alternative out there that costs twice as much, playing a scorched-earth pricing game would leave money on the table. But manufacturers can?? ?t ???beat??? the iPad because they?? ?re still playing by netbook rules. 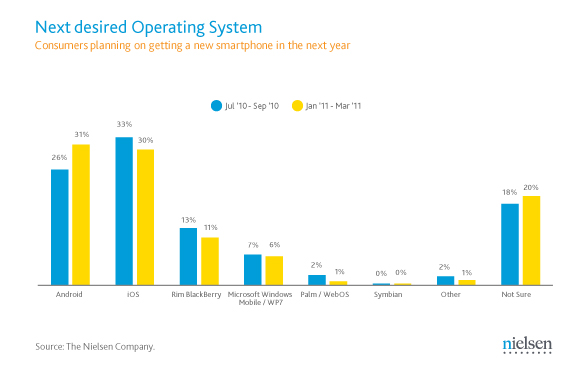 As Stephen Elop said, there will soon be ?? ?200 tablets??? on the market and only one clear winner. But hardware manufacturers are like sharks ??? they can?? ?t sit still. They need to produce products constantly, no matter the popularity, and as a result, on the aggregate, no one device they produce out of the other 199 can touch the reigning king. It may sound hyperbolic but it?? ?s true. However, they?? ?ve been surprisingly reticent to produce many tablets. I?? ?ve heard it said over and over: ?? ?If RIM had released the Playbook a year earlier, they would have owned the space.??? Instead they announced early and hemmed and hawed and then released a device that is potentially superior to the iPad but, in practice, little more than a smooshed out Blackberry smartphone. Nice insight from the supply chain side. Eco – "Writings: IBM vs. Mac"
Insufficient consideration has been given to the new underground religious war which is modifying the modern world. It’s an old idea of mine, but I find that whenever I tell people about it they immediately agree with me. 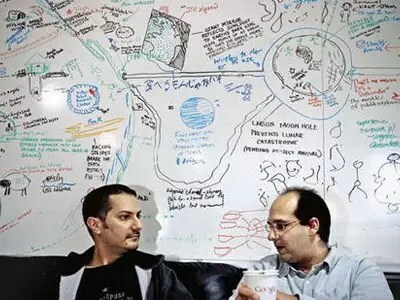 The fact is that the world is divided between users of the Macintosh computer and users of MS-DOS compatible computers. I am firmly of the opinion that the Macintosh is Catholic and that DOS is Protestant. Indeed, the Macintosh is counter-reformist and has been influenced by the ratio studiorum of the Jesuits. It is cheerful, friendly, conciliatory; it tells the faithful how they must proceed step by step to reach — if not the kingdom of Heaven — the moment in which their document is printed. It is catechistic: The essence of revelation is dealt with via simple formulae and sumptuous icons. Everyone has a right to salvation. DOS is Protestant, or even Calvinistic. It allows free interpretation of scripture, demands difficult personal decisions, imposes a subtle hermeneutics upon the user, and takes for granted the idea that not all can achieve salvation. To make the system work you need to interpret the program yourself: Far away from the baroque community of revelers, the user is closed within the loneliness of his own inner torment. You may object that, with the passage to Windows, the DOS universe has come to resemble more closely the counter-reformist tolerance of the Macintosh. It’s true: Windows represents an Anglican-style schism, big ceremonies in the cathedral, but there is always the possibility of a return to DOS to change things in accordance with bizarre decisions: When it comes down to it, you can decide to ordain women and gays if you want to. Naturally, the Catholicism and Protestantism of the two systems have nothing to do with the cultural and religious positions of their users. One may wonder whether, as time goes by, the use of one system rather than another leads to profound inner changes. Can you use DOS and be a Vande supporter? And more: Would Celine have written using Word, WordPerfect, or Wordstar? Would Descartes have programmed in Pascal? And machine code, which lies beneath and decides the destiny of both systems (or environments, if you prefer)? Ah, that belongs to the Old Testament, and is talmudic and cabalistic. Sometimes things change so fast it’s frightening. Sometimes they stay the same and that’s even scarier. This is an excerpt form Umberto Eco’s column in the Italian weekly Espresso dated, September 30 1994. 1994 is almost 20 years ago. An entire generation exists from then to now. Plus ? ?a change, plus c’est la m? ?me chose – the more things change, the more they stay the same, sometimes. Great data. 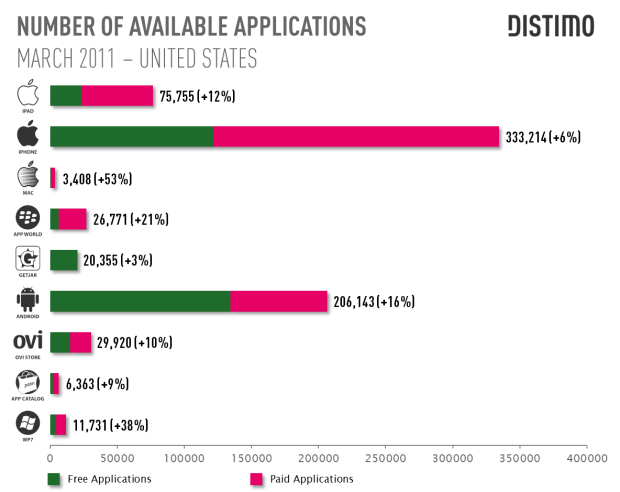 Particularly the balance of free versus paid applications across iPhone versus Android. Does this mean that direct pay for applications is less effective in a ‘Googly’ experience, Or does the Android app business model make it more appealing to provide a free application that is monetized elsewhere? I don?? ?t need every customer. I?? ?m primarily in the business of selling a product for money. How much effort do I really want to devote to satisfying people who are unable or extremely unlikely to pay for anything? Android is winning the numbers game – no surprise – it’s free and very capable. But we all know that that this is not the main story. I find it fascinating to explore how these worlds diverge even as the headlong rush to mobile proceeds. I’d love to hear your impressions. Niche play du jour – a ‘Public Folder for Gmail. Microsoft Exchange, the company’s enterprise email suite, has this feature called Public Folder that enterprise users love that lets them share an inbox. Businesses have been clamoring for that feature in Google Apps, Google’s web-based rival to Microsoft’s enterprise productivity software, for years. And now French startup RunMyProcess has built it, calling it Shared Inbox. Leveraging cognitive shortcuts from one (well loved?) app into another? I still find it fascinating that features like this, from a technical standpoint pretty much trivial, and for most of us just not part of the email experience, are so often the killer feature from business process perspective. Amazon and the cloud rules of engagement. As Amazon’s web services outage passed its third day, the debate on the future of cloud computing is underway. The outage is costing web sites such as Reddit and Quora considerable losses as users turn elsewhere to get their social media needs met. Amazon’s Elastic Compute Cloud service hosts thousands of major web sites that rely on it to serve pages to users. And users rely on these services to store their personal accounts and data remotely. So when the EC 2 service goes down, so do the web sites, and that means users can’t log in to access their data. It’s a big hiccup for an industry that is supposed to grow to $55 billion by 2014, according to market researcher IDC. The duration of the outage has surprised many, since Amazon has a lot of backup computing infrastructure. If Amazon can’t safeguard the cloud, how can we rely on it? So the debate begins on the future of cloud computing and what to do to make users and companies put their trust in cloud vendors such as Amazon. I love the romantic notion of cloud computing, with computing power on tap, minimal outlay, and majestic, infinitely reliable availability. This story feels like the every science fiction novel of my childhood complete with aliens, robots, and rocket-ships. Tragically, this is still a fiction, a dream. But it is a dream deeply believed, apparently, by many. Why else would we see such outrage for an outcome that was predictable, and arguably a good thing. Cloud environments are very large machines, with large-scale components (warehouses) and large numbers of self similar sub-components (servers, virtual machines, processes, etc). This is made more complex by explosive growth alongside the march of progress in servers, appliances, and other components. Cloud environments are extremely valuable, and powerful, but we should not expect perfect robustness. This is not at all to say that the ‘cloud’ should be avoided. Rather that the risks need to be understood, and managed. These failures, and the outrage and disbelief are part of cloud computing transitioning from a fairy tale, into a hard nosed, down to earth, resource. Into something that builds our future. This is an IT cultural transition, collectively learning the upsides, downsides, and rules of engagement for the IT ‘cloud’. Coiled conduits: The microscopic channels in this polymer roll are the right size and shape for bundles of severed nerve cells to grow through them. The scaffold, augmented with electrodes, is intended to transmit electrical signals between an amputee?? ?s nervous system and prosthetic limb. Human-Machine connectivity progress. Another step toward ‘natural’ interfaces? Under the circumstance, it shouldn’t be a surprise that I think great innovation needs a global focus, which is why the Citrix Global Challenge is critically important for the Startup Accelerator. To kick this off I wanted to share some of my thoughts on the types of technologies and directions that are most interesting for the Startup Accelerator. The list on the site talks about trends like ‘mobile’, ‘cloud’ and ‘consumerization’. These are somewhat broad and the flavor of the moment, indeed, most of the breakout companies for the last few years could be described using these terms. To improve clarity I’d like to give an indication of one investment sweet-spot, what I call ‘Alternative futures of the desktop.’ Citrix has long pioneered alternative desktop visions, and is the leader in Virtual Computing – so new ways to solve the desktop problem are particularly interesting. The challenge is that we have too many options for personal data in the cloud.I use Gmail for personal email, but also have old accounts on Hotmail and Yahoo. I have documents in many services ranging from files on the Mac, Google docs, Simplenote, Evernote, and half a dozen others. My backups are a mixed combination of Mozy, S3 (Jungledisk), and my home NAS. The founder of Primadesk recognized that these all act as silos, solving many individual problems well, but leaving severe compatibility gaps. Primadesk simplifies access to your distributed personal digital assets. Their software gives you a single view of all those silos, allowing you to; search across all your documents and mail; backup from one service to another; drag and drop photos from one site to another. This plays into on of the themes where Citrix has long led: new desktop possibilities, new ways to provide the desktop experience. If your startup has new approaches to desktop computing, to the use of mobile, or emerging use cases, we’d love to hear from you as we call for Citrix Global Challenge applications in Silicon Valley, Boston, Cambridge, Bangalore, and Sydney. “There was a designer somewhere in the process who has thought about every single touch point, every single aspect, and has just made every single moment as valid, as graceful, as appropriate, as possible,” he says. BankSimple is due to launch this year. To design the experience, they looked for insights from behavioral economics, which relies on psychology to understand economic decisions. For instance, it’s easier to get people to try something if they have to opt out of it rather than opt in. The team applied this insight to a feature of the bank that allows people to set aside funds toward a particular goal; it’s not a separate account, just a line highlighted on the screen with a label like “Hawaii trip” or “new laptop.” To encourage customers to try the feature, BankSimple starts them with the goal of saving $1,000 in an emergency fund. There is something magical about taking a different tack on an existing problem. This sounds very appealing, but I wonder what happens to the user enthusiasm the first time all that hidden complexity surfaces in a SNAFU. What is this thing called AI? What is a conceptual graph?